All of the charming, natural rooms are shared accommodations at La Selva. There is one private room with bath for 2 guests or couple. Please book together for couple. There are 2 large bedrooms with 5 beds and two smaller rooms with 2 beds. The beds are comfortable and the rooms, although simple in decor are spacious with plenty of room for your belongings. If you are uncomfortable sharing with fun-loving yogis, perhaps this is not the retreat for you! This is a pared down facility with no air conditioning or a hotel-style with daily sheet/towel changes. This is about the stunning location and the yoga and the time to simplify and recharge. (If you want 5-star, in town this is not the retreat for you!) The larger bedrooms have bathrooms with shower in the rooms and the smaller rooms use the shared facilities outside the rooms. In the evenings, the temperatures cool down and delicious breezes filter through the rooms. Linens and towels are provided, but we recommend bringing extra towels. Daily power vinyasa yoga will be led by instructor Shari Hochberg of Sole Yoga Holidays. We will practice on either the outside deck with breathtaking views of the Amalfi Coast or in a covered yoga room with floor to ceiling windows that open fully to enjoy the gorgeous, natural beauty of La Selva’s surroundings. We will go on a private 6-hour boat ride excursion through the gorgeous grottos off of the coast and then a stopover in picturesque Capri. Another excursion includes a beach day at a picturesque location with umbrella and chair rentals included. 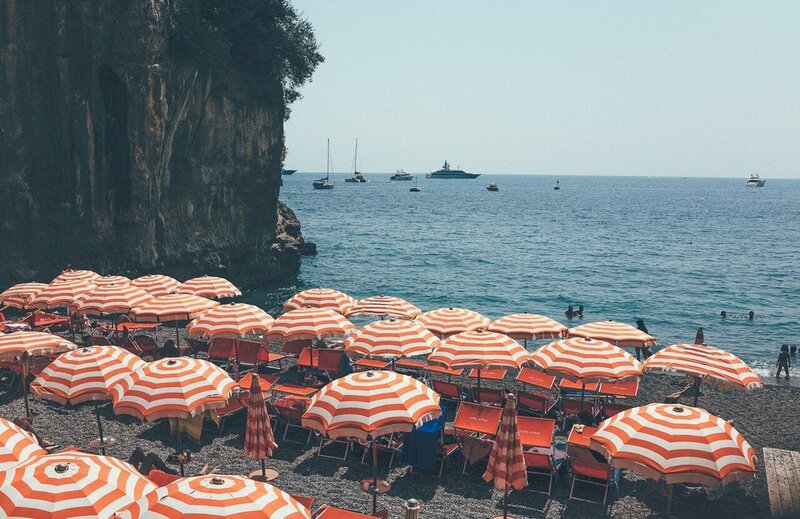 La Selva’s location is a 30-minute hike up from the town of Positano, but close enough for a few hours of beach time or shopping every day during your free time. This retreat is only recommended for intermediate yogis and those in good physical shape as La Selva is only reachable by foot. This beautiful location allows for a quiet, relaxing and private week-long retreat. We try to have lights out by 10.30 so we can fully enjoy each exciting and activity-filled day. Please note that the location does not allow for hiking when it is dark. If you wish to go out in the evenings in Positano, we offer a wonderful yogi/meals/excursion package without accommodations at La Selva. Inquire for more information. La Selva is located in Positano, Italy, but only reachable by foot. We will help arrange a private car service from either Napoli train station or Napoli airport the day of the retreat, July 28 to get you to as close to the facility as possible (15-20 minute hike down from drop-off in Montepertuso). Please arrange arrival to either Napoli train station or airport around 2pm for pick-up. We will arrange for your luggage to be carried up to La Selva so you will not need to carry it up or down the mountain! All info, instructions, packing list will be provided so you have nothing to worry about! Please download our FAQ's to become more familiar with our location and to make sure this retreat is for you!